Last week we learned that a common trait shared by retirees who are highly satisfied with their old-age standard of living is a willingness to work with a financial advisor. That is not too surprising since a new Northwestern Mutual study found that Americans who regularly consult with a professional have more confidence in their ability to achieve both near- and long-term financial goals. Specifically, 84 percent of surveyed U.S. adults that work with a financial advisor said they are at least “somewhat confident” in their ability to find a balance between saving for the future and spending in the present. That included 38 percent who said they are “very confident” navigating the balance between saving and spending. Only 14 percent of respondents that do not seek outside guidance could report the same level of confidence in balancing near-term spending with long-term saving. The study also found some notable differences in the financial priorities of surveyed adults dependent on whether they work with an advisor. Debt reduction, for instance, was the top money-related aspiration among all respondents in 2018, but individuals without an advisor cited a need to reduce debt at almost twice the rate of those that work with a professional. Further, surveyed adults that consult with an advisor were significantly more likely to say that they want to review their retirement plan and rebalance their investment mix this year. At the same time, respondents abstaining from outside advice were much less likely to say they have intentions to review their tax strategies and beneficiaries. 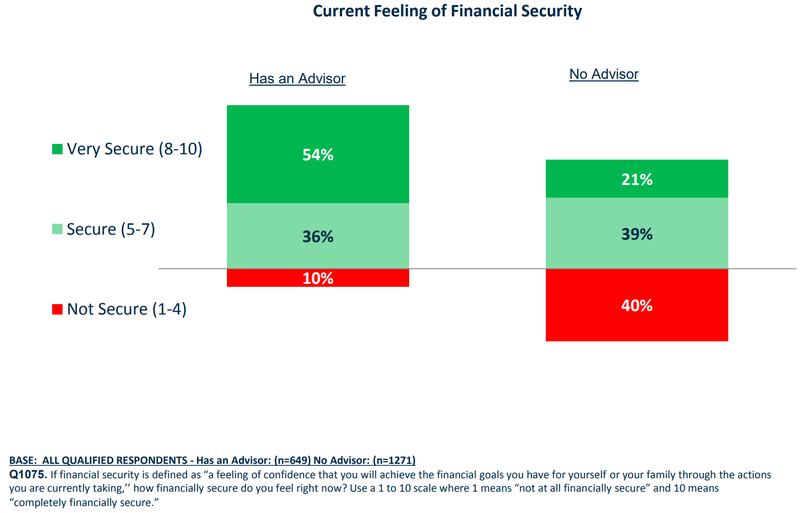 More generally, nine in ten surveyed Americans that work with and advisor said that they currently feel financially secure, including 54 percent that feel “very secure.” Only 60 percent of respondents without an advisor reported that they are at least “somewhat secure,” while and alarming 40 percent said that they do not feel secure at all about their current financial situation. Surveyed adults that work with an advisor were also a lot more likely to describe themselves as a disciplined financial planner and say that they are prepared for volatility in the stock market. 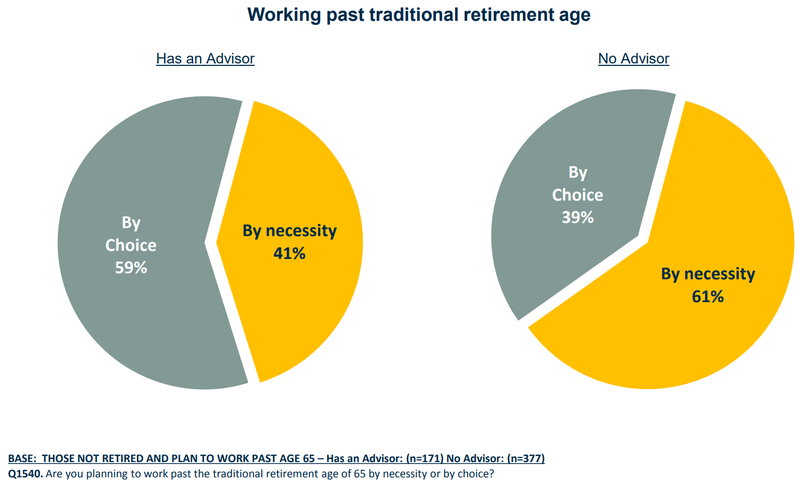 Perhaps most importantly, respondents that consult with an advisor were much more confident that if they wind up working past the traditional age of retirement it will be by choice rather than out of necessity.